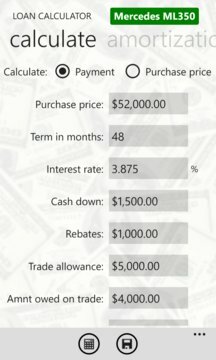 Auto Loan Calculators Pro is the paid version of Auto Loan Calculators. Trial has no expiration date with ads supported. To remove ads and support further development of the app, please buy. Auto Loan Calculators is a 3-in-1 calculator, specifically designed to help you make better decision when buying and financing your car. I. Auto Loan Calculator enables you to project how much your monthly payment is on an auto loan or to find out how much loan amount you can afford. 1. Easy to use and fast, allowing quick data entry. 2. Calculate the amount to be financed and monthly payment on an auto purchase. 3. Calculate how much loan amount you can afford, given a monthly payment on an auto purchase. 4. Amortization table details each periodic payment, showing date, interest, principal and balance. 5. Various graphs help visualize and analyze your auto loan at different angles. 6. Ability to save loan along with descriptions for future reference. 7. Live tile support to show your current loan info right at the phone Start screen. 8. Ability to send loan info. to clients or friends via email, test message and social networks. 9. Many more features, plus elegant design you need to check out to see. II. Cash Back vs. Low Rate calculator helps you decide whether to take cash back or low rate offer. Users has the ability to load saved loan for quick data entry. Just modify interest rate and cash back fields appropriately according to the auto dealer offer and hit "calculate" button. III. 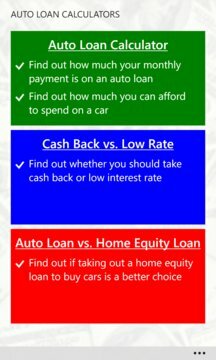 Auto Loan vs. Home Equity Loan calculator advises you whether or not to take out a home equity loan to buy your car.